ranges from western Washington south into central California. 1000-2000 m in the mountain slopes of the Pacific Coast region, may also be found in valleys and sheltered ravines. Several disjunct populations occur in western Washington in the vicinity of Puget Sound. may occur as either a subdominant tree or a dominant understory shrub, depending upon moisture conditions, elevation, and overstory density. 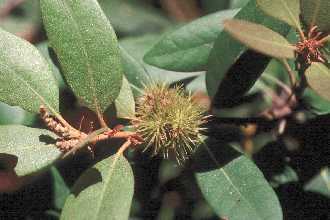 Hand pick the burs in late summer or early fall, after ripening but before they open. Spread them out to dry in a warm room and run through a fruit disintegrator or shaker to separate the nuts. The fruit ripens during August and September. Seed - best sown in a cold frame as soon as it is ripe. As soon as they are large enough to handle, prick the seedlings out into individual pots and grow them on in a greenhouse for at least their first winter. Dry rocky soils to deep rich soils. May be planted as seeds or seedlings. Plant them out into their permanent positions in late spring or early summer, after the last expected frosts, and consider giving them some protection from the cold for their first winter outdoors. Slow growing with a moderate lifespan.